Well as I posted a few weeks ago, I've wanted to start a hand mirror collection to create this. Well I have 4 mirrors now and I decide to start hanging them. I'll be getting more as they become available and adding them to the display, but this is a start. I can't wait. If you are going to be there LMK and i'll tell you where to meet us. Can't wait to show you what treasures I find. I've decide I have a favorite color, It's Green. I like most shades of green except 70's avacado. I realized I have some form of green in almost every room of my home. In th 90's it was hunter green, Now it's sage, teal, and some other shades. I have at least 3 rooms painted in shades of green, and the others have green accents. Green is a very calming color, it also seems clean to me. Culture of Green: Green is the national color of Ireland and is strongly associated with that country. Because of all the green in nature the color is reminiscent of Spring. Coupled with red it's a Christmas color. From Wikipedia:A green room is a room in a theater, studio, or other public venue for the accommodation of performers or speakers when not required on the stage. In some explanations it is said that the colour was a response to limelight – early stage lighting. Green is also thought to be a calming and soothing colour but this is according to 20th century psychological theories so can not be the origin of the term. The most widely accepted origin of the term dates back to Shakespearean theatre. Actors would prepare for their performances in a room filled with plants and shrubs. It was believed that the moisture in the topiary was beneficial to the Actors' voices. Richard Southern, in his studies of Medieval theatre in the round, states that the acting area was "The Green". The central space, often grass-covered, was used by the actors, while the surrounding space and circular banks were occupied by the spectators. Since then "The Green" has been a traditional actor's term for the stage. Even in proscenium arch theatres there was a tradition that a green stage cloth should be used for a tragedy. The green room is thus the room on the way to the green. It has been suggested that the original 'green room' was in a London theatre converted from office buildings. The room behind the stage had previously been used to cut deals and was known as the 'agreeing room,' and the phrase has become corrupted over the years. I'm also realizing that Green is also a verb. Hollywood is going green (Meaning Eco-friendly). I'm Green with envy (meaning jealousy). I'm feeling a little Green (meaning sick). Oh and btw, I hate green vegetables. Even though Green can have some negative meanings (jealousy & sick & Vegitables) I still love it. I think everyone should give it a "green light" and have a "green room" and "go green". Your neighbors will be "green with envy", and may feel a little "green" because of it. For now, I'll try and eat my "greens". Well I'm finally tackling my own "old bed/crib bench". What looks simple isn't always so. Due to the fact that I feel someone will eventually want to sit on this bench, I feel it must be strong. So to organize my ideas, I've added a page to my web site. Click here to view other great and inspiring benches, as well as follow DH's and My progress with mine. This is what we've done so far. On another note, I am getting excited about my Garage/Barn sale. I'm clearing out closets of the junk that we've accumulate and it feels so good. Sale isn't until Late Summer or Fall so I've got plenty of time, so no need to rush. Hope you all had a great Memorial Day. Well GS are few and far between today, but I did pick up a few good things. I found this window table already made for just $5.00. I made one similar to it about 2 weeks ago. It can be seen on my "past Projects of the week" page. I also picked up this old school desk for $2.00. I will probably leave wooden top as it is, but I'll clean up the metal parts and give them a paint job. I think it would make a nice bedside table. It's the right height and even has a place to store reading material etc. I've been able to work on a few past GS finds. I painted and these 2 items, and am please at how they turned out. You can see before pics by scrolling down to past posts. I also picked up a new book at a GS for a quarter. It's called Trash to Treasure by Leisure Arts. I've passed up on this book before, but it has a few good projects in it. I'll write a review in a few weeks so check the web site for that. Take care, and have a great holiday weekend. Anyway, My Youngest Son got his Drivers License on Monday, so my life is about to change dramatically. I'm already missing not spending time with him to and from school each day. I've never liked the waiting to pick up after school, but I guess I really did enjoy the one on one time in the car on the way home. Unfortunately on Tuesday he got fired from his first job. This took us all by surprise since he is such a hard worker, but apparently they wanted someone with better people skills. He was officially fired for not smiling enough. But he came in this afternoon announcing that he will be getting a new job at a pizza place, so all is not lost. I like pizza better than ice cream anyway. My first real job was at a pizza place, I still have fond memories of it. I've managed to create a few thing this week for ebay, but nothing big. I've got my projects of the week already picked out so check the web site on Thursday for updates. Well It's almost June and time to review my New Year's resolution. I usually don't make resolutions but I did this year, although I've modified it a bit from what I start with. My resolution was originally to stop buying "stuff". Shortly after the new year I realized that what I really wanted to do was to stop buying CR*P. This resolution is what has fueled my T2T passion. I still like to change things in my home, but I'm sick of spending money. I realized that it's now almost 6 months into the year and I've done pretty well. My Walmart/Target file has only 2 receipts in it. Did you hear that, 2. That is awesome in my opinion. I have also not set foot in Linens N things or BB & Beyond all year. I have no desire to do so either. Went in Hobby Lobby yesterday with DH for him to get some glass, and I browsed, but did not buy. Frankly I don't want any of that stuff anyway. I'm almost to the point where "new" turns my stomach. We can have so much without having "new". My creativity has been fueled and I'm not feeling as if I'm doing without. I'm spending less time in front of the TV, and I'm very very happy. And all of this without setting foot into a Walmart. Well I wasn't going to but decided to anyway. DH and I hit a few GS this morning and with his help and truck I was able to do well again. It's an old radio cabinet. The lid lifts up and there is a pocket inside for I don't know what, music, instructions etc. See the door sitting there on the ground. Wouldn't that look good painted with stained glass behind it. I also found 4 of these shutters yesterday. I'm going to paint them and put tin ceiling in behind them. a roll of papertowels in my workshop. I'm going to do up a cottage blue/white bedroom. This will be the headboard for that room. I finally have all the pieces. It will be all white. Those shutters are the only I've seen like this. There are louvered parts in the center and fixed parts on the outside of each one. Before this is made, I may find a different piece to use as the top but for now, this one is set aside. Today my House need some attention, so no time for the workshop, that'll have to wait. Let me first say that I drove all over town looking for this one sale and whenI got there, I found nothing. But all was not lost, because in my hunting for the right road, I found 2 other Yard sales, one that had some great old junk. At the best sale I found this chest. It's either a night stand, or a child's dresser. I love the shape and I think it will look nice with new nobs and some cleaning up. It was $5.00. I think you'll agree it was a bargain. That I will make a hook hanging rack out of. The green thing is a metal bread box with 2 compartments. I think the thing on the right is some sort of lamp. It's very heavy with a great ornate base and this platform that came off of it. With an ornate iron handle. Any ideas what I can do with the parts? Well How'd I do. Any ideas for the iron lamp thing? I almost forgot, I got these 2 school chairs for free and the other chair for about $1.00. I'm a firm believer, that the best stuff at Estate Sales, can be found in the Garage and Shed. Today's sale was no exception. I went through the house first and found the mirror (more about that later), then I headed outside to the shed, where I found this great game called Canoga, or Shut the box. A Game I knew nothing about until today, but I couldn't pass up this wooden box with numbers and flaps that covered the numbers. I'll probably clean out the old felt and either try to re-felt it or paint it. Now for the Mirror. I've had this picture in my idea book for awhile now. and I"ve been looking at these old dressing table mirrors to do something like this. But these mirrors are not cheap, they go for between $20-$40. This one was priced for $5.00 so I scooped it up. First step to a new collection. The tray was a bonus find, don't know what I'll do with it. The 2 door plates were found at a separate sale for .50c. All in all i spent $9.50. And this is only Wednesday, can't wait for tomorrow. I spent some time in the barn today, not as much as I'd like. I finished up another birdhouse. Please take a look at Tina's blog for a great Old Window Greenhouse. She has information on how to order these wonderful items too. I am also whittling away at my "list" below of yuck stuff I have to do. Tomorrow my goal is to get my Car oil changed. There is one estate sale in town tomorrow so I'll hit it on my way to work in the morning. I wish more people would reply to my posts. I know people are viewing them based on the little counter I have, but very few responses except from rosemary and tina, and One Woman. Thanks to you all. Everyone else, please let me know you are out there. Well I spent the weekend traveling and resting, but I did manage to get a little bit done in the barn. I'm currently working on a table made from an old window. Here's a peak at the finished project. I'm also working on several other projects for my October Barn Sale. I've got a shutter coffee table, a shutter corner shelf, another table similar to the one above as well as some other stuff. The little birdies are growing, Here's a pic from today. here's a little IQ test for your enjoyment. This is very fast so be prepared. You only have 8 seconds for eacdh question. But it's a good test of some of our old minds. click here and have fun, let me know how you did. I headed over to that junk place I mentioned that was going out of business. I was talking to the man asking if they had any windows or spindles and he said I was welcome to look through his "trash" pile, and take anything I wanted. Wow, I found table legs, tables, chairs, a sewing machine table and lots of stuff. Then the guy who owns the whse across the ally said he was getting rid of his stuff too and was having an estate sale down the street, but He was here to pick up a load and I was welcome to look through his whse. I got 5.00 worth of stuff and headed down the street to the estate sale where I found Parts of beds, a great marble table, spindles a clock and a finial all for 10.00. We still have to go back with the trailer and pick up some of the free stuff tomorrow, but I'm so excited. Here are some pics. for display racks, any ideas what I can do with this one? First off, Bird Babies look about the same today. I hate to bother them for another picture. But I will get one this weekend. Second, I have to help this lovely lady with costume changes, backstage at the local ballet tonight so updates will be later tonight. Check back later tonight for web page updates. Again this year I am blessed with a Cardinal's nest. The chicks have hatched and I'll be posting progress pictures almost daily. I love to watch this process. This pic was taken yesteday. A special issue of BHG, 100 ideas Flea market style. Inside I found many ideas I've seen before, but lots of ideas I had not yet seen. 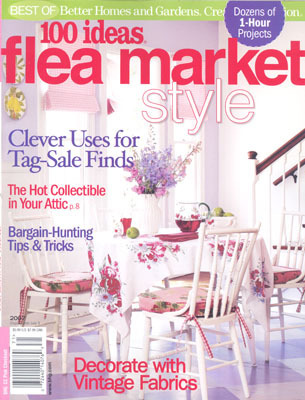 They've gathered up Flea Market ideas from their many magazines from the past and put them all together in this one issue. If you can, pick it up, it's a good resource. As I was vacuuming this morning I began to think of all that yuck stuff that I need to do. The stuff that requires appointments, taking time off work, waiting in waiting rooms traveling and even getting undressed. You know the stuff i'm talking about. here's a general list of what I need to get done but have not had time. Yuck!!!! All of it is unpleasant, and all of it costs money. So, my goal is to take one item off the list each week. Half the work is getting on the phone and making the appt. So I'll try to do one or two of those this week. The first item has already been scheduled so that'll be done this week. I think I'll work on the carpets or exterminator for next week. All this maintenance, it's just not fun. And for all of you women who are gonna yell at me to get the Mammo done first, It's on the schedule and will get done. I'm not late on it yet. I encourage you to look into the maintenance you need to do on yourself, and get it done. You only have one body, take care of it. So you can have many years of Junkin and craftin. Friday & Saturday GS Finds and Getting Tagged. I feel like I did pretty good this weekend with the GS's. I picked up a cute little child's chair for only 2.00, and a picnic basket full of bakelite utensils for only 4.00. I also got a couple of lamp shades for future lamp projects as well as some other stuff for who knows what future project. And a couple of old Yard/garden tools, a nice picture frame, a tissue basket, and an old retro lap desk with lifting lid. On another note, Rosemary has tagged me. So I think I'll have to share 7 things about myself that are strange or weird or something. So here goes. 7) I loooove Science Fiction, TV and movies, but not scary stuff, mostly space stuff. I'm not gonna tag anyone, because I've not been on here long enough to know anyone who has not already been tagged. Internet is working for now so I was able to update page 1. I've got more great ideas to add throughout so keep checking daily. I've got some good stuff going on ebay this week too so keep an eye out. My friend's MIL who did the painting of my home (see below) would love to have more business. She will paint a watercolor of your home in the same style using pictures you provide. If you are interested please Let me know. Here are my Garage Sale Finds from yesterday. Happy weekend everyone. This is an iron plant stand and a metal cabinet. I'm going to paint the cabinet green and repair the handles. It also has a key and works as a safe. Love the 3 little drawers on top. It's a real utilitarian piece and was cheap. I also found another piece of old luggage for $1. I Dont' need it but I picked it up anyway. So sorry that the Thursday updates were not made last night. Our internet at home is down and as of this morning It's still not working. I can post this at work, but I cannot update my pages from work, so updates will be made as soon as possible. I have great new projects for this week so be sure to check back. Garage sales today were Blah!!!! but Yesterday was pretty good. I'm trying to decide if I want to spend the gas to go to the First Monday trades days in Canton TX tomorrow. I probably won't. I'm finding much of what I need here locally at the GS. I've updated the Yard Art page as well as added some links/blogs today. Check out Linda's Birdhouses on the Yard art page, they are awsome. Well Yesterday and Today have not been very productive. It's been raining here for 2 days and that means that anything I paint will not dry. I'm making progress on shutter birdhouse #2 and a few other projects for next week's ebay offerings, but nothing new or exciting... to me. My son started his first job yesterday, He came home very tired, but it's the good kinda tired when you know you worked hard, and you sleep well. I think I've decide to have a "barn sale" in the Fall. I'll work all summer creating stuff (that's too big for ebay) and then have one big sale when the weather starts to cool. I think I can lure people out here with the right advertising. Sometimes just saying "barn sale" is enough to get people to drive a little ways. We really arn't that far from town. Well those are my musings for today, sorry no new pictures but check the web page on Thursday for new projects.